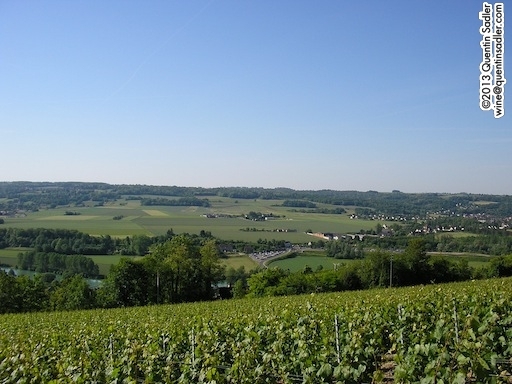 The beautiful vineyards of Champagne. A lot of time we talk about Champagne as though it is all the same. The truth is though that the only thing most Champagnes have in common is the fact that they are fizzy. Each house has a different approach which makes for a wide array of Champagne styles. Some are rich, Pinot Noir dominated and barrel fermented, whereas others are citric and light as air – with lots of variety in between. No, in reality Champagne is as varied as any other wine, but because the fundamental nature of the different wines is similar the differences are often nuanced. However, because the palate of grapes is very small – really just 3, Chardonnay, Pinot Noir and Pinot Meunier, although there are some old plantings of other grapes still in production – the variety is quite astonishing. Much like music, which is all written with 7 notes, Champagne is all created with a tiny repertoire of raw material, which just makes the differences all the more remarkable. Not many of us get to taste a huge variety of Champagnes – sadly. So I cherish the moments that I can and recently I have been doing some tastings of the Taittinger range and I thought it might interest some of you to know about their different cuvées. When people say they have had a bottle of Taittinger – or indeed Moët et Chandon, Laurent-Perrier or Bollinger et al – they usually mean that they drank the standard offering – the standard bearer of the house. This is normally the Non Vintage Brut, but almost all houses produce a much wider range than that, making rosés, vintages, a cuvée de prestige and even sweeter or drier Champagnes and these are all often worthy of much more attention as they can provide fabulous wine drinking experiences and give a fuller picture of this amazing wine region. So, it is always a pleasure to lead tasters through the complete Taittinger range as the wines are all so different and take them by surprise. I really like them too, which is always good. 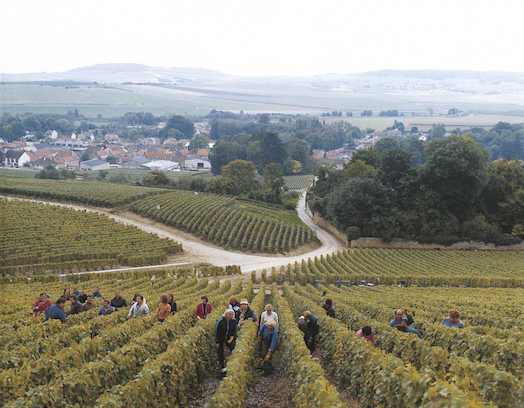 The harvest in full swing at Taittinger – photo by kind permission Champagne Taittinger & Hatch Mansfield. Thai-Ton-Jay would appear to be the proper French pronunciation of Taittinger, but to achieve that I have to concentrate hard and get my tongue in the right place first! Luckily it seems that we Anglo-Saxons are perfectly ok saying Tatt-inger – phew! However as the family originally hailed from Austria, way back in history, then a Germanic Thai-ting-er could also be considered quite proper. Take your pick, but whichever you choose to say, do try the whole range. Taittinger is a rare beast for a Champagne house, in being owned and managed by the family whose name is on the label. This is no mean feat in the modern world when Champagne is often seen as a luxury rand product rather than a wine as such, as far as I am aware Bollinger is the only other world famous Champagne house to remain a family company. It must focus the mind somewhat having your name on every bottle and being ultimately responsible for the quality and style of wine that your family produces and under the management of Pierre-Emmanuel Taittinger I think the wines have evolved and the quality has really shone. Everyone knows that Champagne is fundamentally dry and that Brut means a dry Champagne, but what many people do not seem to know is that Brut Champagne is a relatively new concept. It first appeared in the late nineteenth century and was aimed at the British market which had always favoured a drier Champagne style. It caught on slowly and the idea of producing more pure styles of Champagne that were more like wines than the sweeter cuvées of the past – many nineteenth century Champagnes had sugar levels akin to dessert wines – was one of the ideas that caught Pierre-Charles Taittinger’s imagination in 1931 when he bought and completely overhauled the venerable Champagne house of Jacques Fourneaux which had been founded in 1734. So, right from the beginning the idea was to make elegant and pure Champagnes that were dry and in order to do that the Taittingers decided to concentrate on using Chardonnay, as they felt that gave them the lightness, but complexity that they wanted. 40% Chardonnay dominates the wine together with 35% Pinot Noir, 25% Pinot Meunier blended from vineyards across the region and then aged 3 years on the lees. I really enjoy this wine because it light, fresh and vibrant, but has depth of flavour too. There is a creaminess running all the way through it, as well as citrus, green apple and a touch of peach. There is crisp, but not startling acidity and the mousse is soft and creamy without being frothy. There is also a touch of caramel and digestive biscuit to the palate that gives a nice smack of complexity, but the finish is dry and clean. It is a wine that you can focus attention on and savour its subtle charms, or just enjoy it and let those charms wash over you. 90/100 points. Widely available in the UK @ £38.99 per bottle. 35% Pinot Noir, 30% Chardonnay, 45% Pinot Meunier with 15% of the Pinot Noir being red to give the colour – the Pinot comes from Ambonnay, Bouzy & Les Riceys. The finished wine is aged 3 years on the lees. This is a real charmer of a wine, the colour is a deep wild salmon meets strawberry and the richness of red fruit makes the wine seem much less dry and acidic than it actually is. So if you like a softer style of Champagne then this could be for you, certainly the palate gives lots of red fruit, raspberry and even blood orange. If you age it for a few years the fruit mellows somewhat to a more rose petal quality making the wine quite different, but just as lovely. 90/100 points. Widely available in the UK @ £47.00 per bottle. 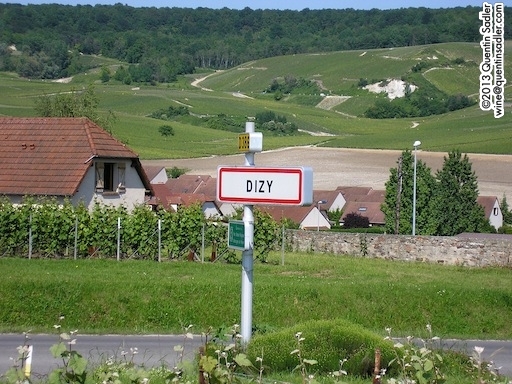 The wonderfully named Champagne village of Dizy, Bouzy is not far away either! 40% Chardonnay together with 35% Pinot Noir, 25% Pinot Meunier, aged 4 years on the lees. 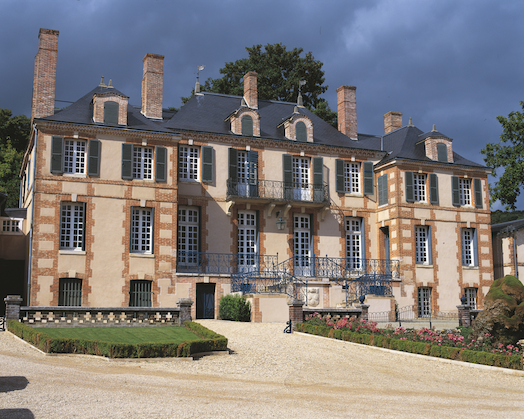 Much of the fruit comes from Taittinger’s own estates including some from their Château de la Marquetterie. The idea here is to make a soft Champagne that is drinkable after dinner and long into the night – or indeed any other time, I find it’s good at breakfast! People often assume that this will be sweet, but it isn’t at all. There is 17.5 grams per litre of residual sugar, but remember how high the acidity is in Champagne, well here the acidity and the sugar balance each other perfectly, so the wine finishes clean and balanced. It is soft, not sweet at all, the palate is creamy and there is a gentle nectarine quality to it and and an eating apple crunch. This might be perfect if acidity is not your thing, or if you want a Champagne that can withstand traces of something sweet on your palate. 90/100 points. 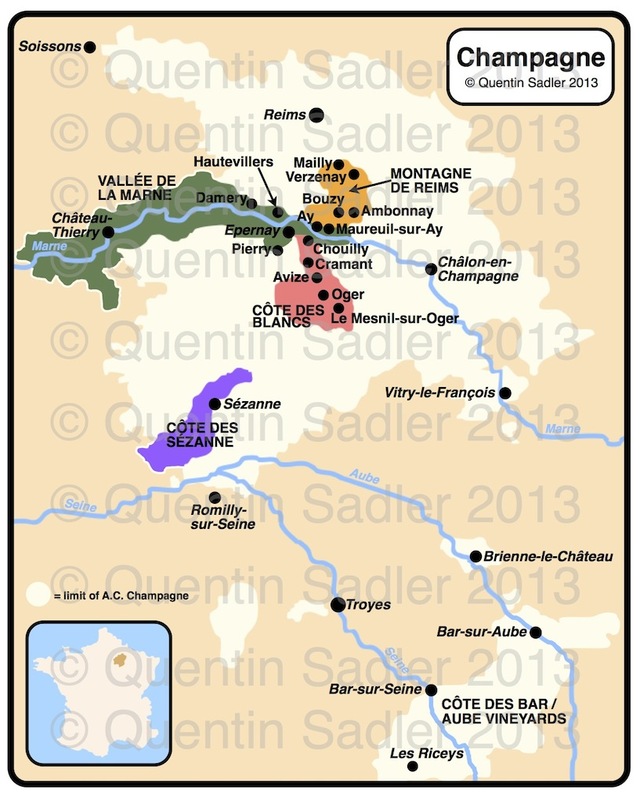 Firstly the climate of the Champagne region is not very generous, look where it is on the map, the conditions are very like England actually, but with more extreme winters from the Continental climate, so not every year produces a great harvest – this was especially true in the past before modern viticulture and winemaking gave greater control. As a consequence the tradition developed of holding back stocks of the good years to blend with the more ordinary ones and to create a house style rather than the normal way of making a wine every year. That is why most Champagnes are sold without a year on their label and this method has done wonders for the region and allowed them to create more complex and fascinating wines than would otherwise be the case – in my opinion. Champagne is about as far north as France can comfortably make wine, so growing grapes there is quite marginal and it isn’t easy to always coax good ripeness out of them, but every now and again – 2, 3 or 4 times a decade and seemingly becoming more frequent – they have a great year and declare a Vintage and sell some of that year as Vintage Champagne which is all the product of that single harvest. As you might imagine these Champagnes are richer and more concentrated and the winemakers let the style of the year shine, rather than their house style. Other differences can come from the choice of grapes, with 3 to choose from, on the whole anyway, it might seem pretty limited, but a pure Chardonnay – a Blanc de Blancs – Champagne will be very different from a pure Pinot Noir or Pinot Meaner – a Blanc de Noir – Champagne which will tend to be darker in colour and richer on the palate with more red fruit notes. The use of oak can make a big difference, barrel fermented Champagnes are very different from the fresher, lighter styles, try Krug, Bollinger or Alfred Gratien if you have never tasted one made that way. Different Cuvées can be very different from each other too. Really cuvée means blend and different blends of grapes will indeed give very different Champagnes, but the word is also used to designate one wine from another, so just as a producer’s non vintage will taste different from their vintage Champagne, then their other cuvées will be different again. Most famously of course the majority of houses create a top end Cuvée de Prestige made from the finest fruit and usually from a single harvest – although Laurent-Perrier’s Cuvée Grand Siècle is a non vintage cuvee de prestige. These wines are normally from the finest grapes – often from Grand Cru vineyards – or from the best vineyards avaialabe to the house. They are normally made from the first pressings only, which are the most gentle and thought to produce the purest Champagnes. Then to top it off they are bottled and riddled by hand and to prove it – as well as look enticing – these wines are usually bottled in a replica old style bottle that does not fit the machines. Sweetness of course can make a big difference in how a Champagne tastes and just before the bottles are sealed with a cork a little cane sugar is added – dosage- to each bottle to determine how dry the wine is. 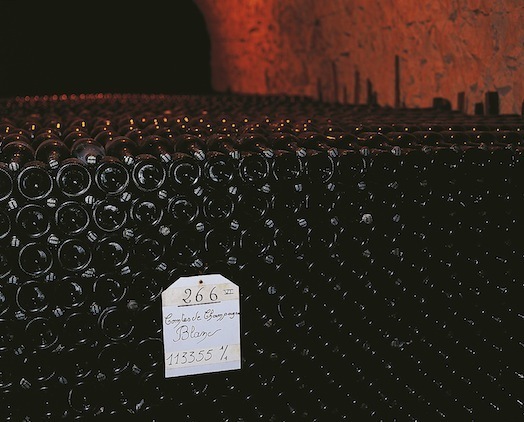 Brut is the normal which can vary between 5 and 12 grams per litre – although Taittinger are now 9. This is done mainly to balance the high acidity in the wines rather than to make them sweet and Brut Champagnes seem totally dry, although Exra Brut is drier and Non Dosage has no sugar added at all. Ageing can also make a big difference to the style and taste of a Champagne. In Champagne this means ageing in the bottle on the lees, which are the dead year cells left over from fermentation. The legal minimum for non vintage is 15 months – 36 for vintage – and the longer you age it the more flavour, complexity and richness you get. Ageing on the lees develops that yeast autolysis character that gives, yeast, bread, brioche and, flaky pastry and digestive biscuit characters. 50% Chardonnay and 50% Pinot Noir from mainly Grand Cru villages in the Côte des Blancs for the Chardonnay and the Montagne de Reims for the Pinot and then aged 5 years on the lees. If you are ever feeling jaded and tired of life then this wine has a wonderfully restorative quality. The sensations here are of concentrated fruit as the vintage is only made in occasional exceptional years, however not only is the fruit more powerful, but the acidity is fresher and the weight is greater too, so this is a very intense wine. Red fruit notes and ripe peach vie with each other on your senses, while the savoury, nutty, brioche lees characters add more depth and the rich seam of acidity keeps it all fresh and elegant too – a glorious Champagne with a firm and steady mousse and a wonderful feeling of tension running through it giving it poise and elegance. 92/100 points. Widely available in the UK @ £53.00 per bottle. Taittinger’s beautiful Château de la Maruetterie near Pierry – photo by kind permission Champagne Taittinger & Hatch Mansfield. A single vineyard Champagne – a very rare beast indeed – from the vineyards around Taittinger’s own Château de la Marquetterie in Pierry near Epernay, which quite apart from being a beautiful place has a south and southwest exposure and so creates beautifully ripe fruit. The blend is 55% Pinot Noir to 45% Chardonnay a small portion of the latter is fermented in oak vats which lends a subtle toasty spice to the finish as well as weight to the palate. It is aged for 5 years on the lees. This is an exciting Champagne with more richness and savoury qualities than the others. Again it is concentrated, but has bigger bolder characters and in some ways feels like a mature vintage Champagne. Personally I do not regard this as a Champagne to drink while standing and nibbling twiglets, for me this needs a meal – although feel free to serve it to me with nibbles – and would be perfect with a lovely piece of good quality fish. 92/100 points. Widely available in the UK @ £55.00 per bottle. What to do? You want vintage Champagne with all that richness and savoury brioche character, but cannot be doing with ageing some and anyway you want a slightly softer fruit character to give a touch of the frivolous, yet still keep it elegant and refined. You probably guessed it, you drink this. 50% Chardonnay grapes from the Côte des Blancs – including Avize and Le Mesnil sur Oger – blended with 50% Pinot Noir from the Montagne de Reims – including Mailly & Ambonnay. The finished wine is aged 5 years on the lees. Another glorious cuvée that manages to be intense and soft all at the same time. This makes it very appealing with rich fruit and similarly rich leesy characters and complexity. The mousse is markedly softer than on the vintage, yet firmer and more precise than on the Brut Réserve Non-Vintage. 92/100 points. Widely available in the UK @ £49.00 per bottle. Comte de Champagne Blanc de Blancs ageing on the lees in the Saint Nicaise chalk cellars below the site of the Reims palace of Thibauld 1V King of Navarre and Comte de Champagne – photo by kind permission Champagne Taittinger & Hatch Mansfield. One of the greats of Champagne this cuvée de prestige is 100% Chardonnay from the Grand Cru villages of Avize, Le Mesnil sur Oger, Oger and Chouilly in the Côte des Blancs. 5% is aged in new oak barrels for 4 months to add complexity and richness and the finished wine is aged for at least 7 years on the lees before release. James Bond fans will know this was the favoured Champagne of Ian Fleming’s spy in the early books and I for one can see why – JFK seemed to enjoy it too. This is the most delicate. mineral and fine Chamapagne that I have ever tasted. It oozes finesse and breeding and subtlety, but has many more obvious charms too. I often think this is the most ‘wine-like’ Champagne that I know, it sort of seems like the finest Chablis you can imagine, but with a delicate and taut mousse. 94/100 points. Widely available in the UK @ £147.00 per bottle. 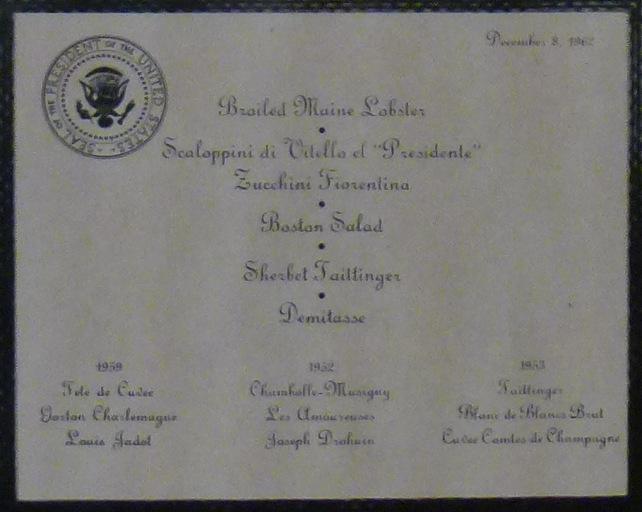 JFK was served the 1953 Taittinger Comte de Champagne at Hollywood’s La Scala restaurant in December 1962. So you see there is enormous variety just from one Champagne house, which is good isn’t it. Something to suit every mood, food or occasion and so much more to enjoy. Further stockist information for the UK is available from Hatch Mansfield. Taittinger is represented in the US by Kobrand. In the spirit of openness, I do sometimes do some presenting work for Taittinger, but this is my genuine and unsolicited opinion. I happen to like their Champagnes very much indeed. 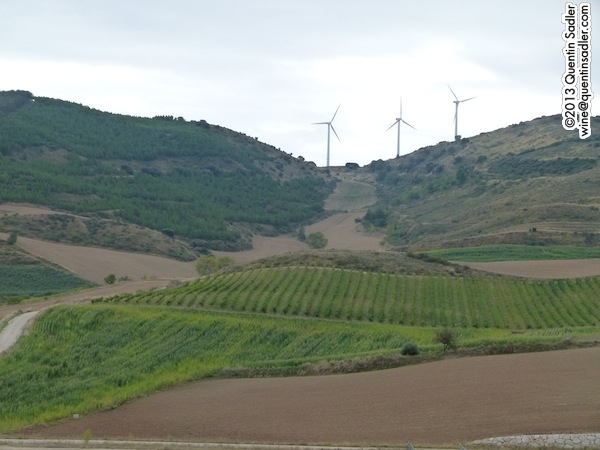 Navarra’s landscape – count the windmills – Don Quixote would have had his work cut out today! I have recently returned from my first wine trip to Navarra and I am excited, as well as mystified, by what I found. History long ago robbed Navarra of its coastline, although the northern tip is very near the sea, while modern economics has so far deprived the region of an international airport, so the easiest way to visit is either via nearby Bilbao or Biarritz and it is well worth the effort. The thronging streets of Pamplona. 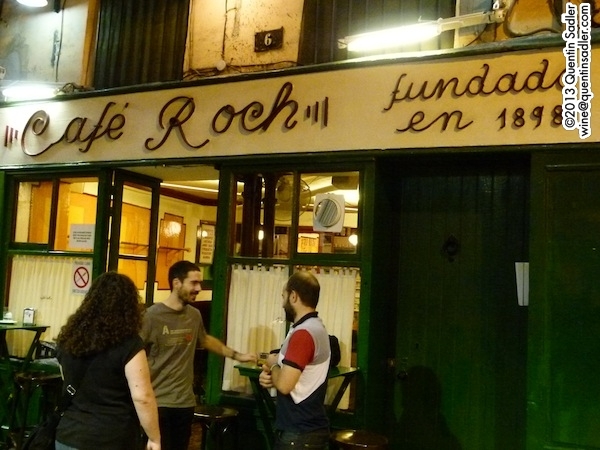 One of Pamplona’s many excellent bars. 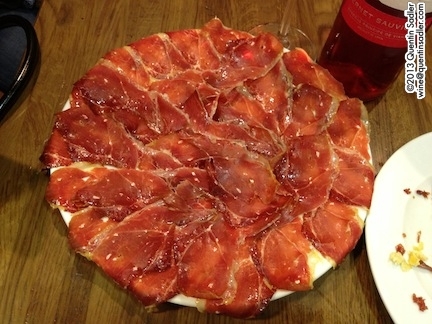 Dinner, Spanish ham is the very best thing with any wine. Pamplona, the region’s capital, is a compact, handsome Spanish city with a lovely mediaeval centre whose main square, the delightful Plaza del Castillo, is surrounded by enticing little streets lined with superb tapas bars and teeming with life – except on a Sunday night. 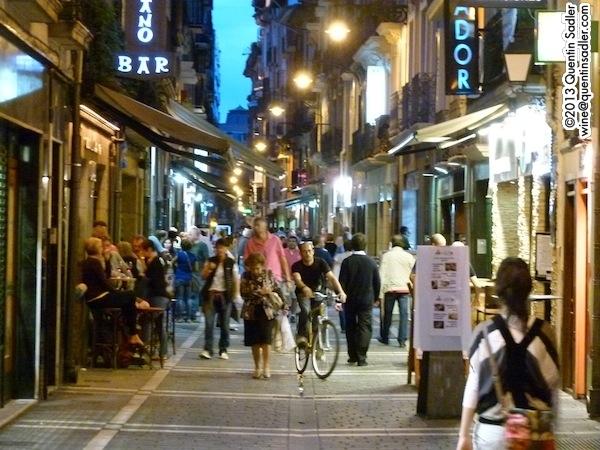 The square itself is home to the famous Café Iruña which is well worth a visit as it is a great bar serving just about anything you could imagine from chocolate y churros to full meals. It is also a tourist attraction itself though, as it is an incredibly beautiful building whose sumptuous interior dates from 1888 and was once Ernest Hemingway’s watering hole of choice – indeed their restaurant on the mezzanine floor is named in his honour and there is a bronze statue of him at the bar. 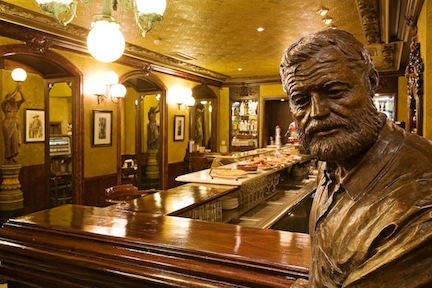 Hemingway at the Café Iruña. 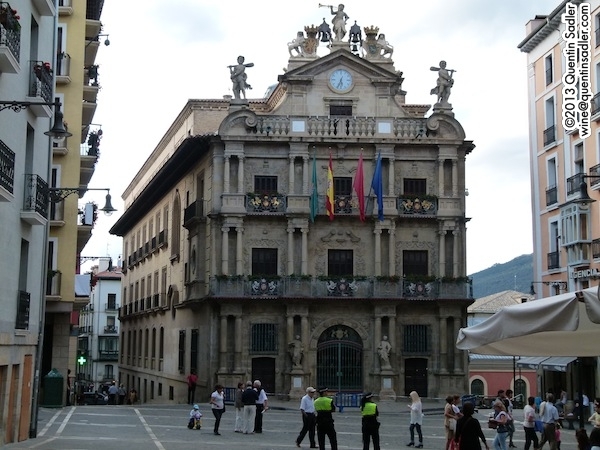 There is much for a hedonist to enjoy in Pamplona and I would highly recommend that you spend a few days there. 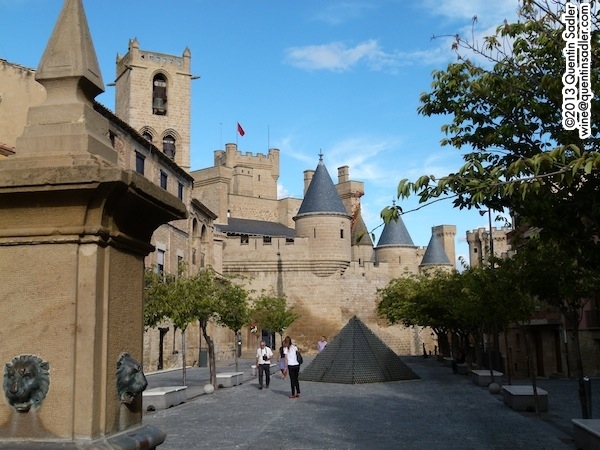 I was also very glad to renew my acquaintance with Olite which is a small Navarran town that is home to the 14th century Palacio Real de Olite and whose Parador is in a 15th century palace and castle. I spent my 4th birthday there and well remember the mixture of excitement and trepidation I felt when passing the suits of armour on the stairs leading up to our turret room – perhaps I had watched too much Scooby-Doo, as I was certain they would come to life and attack me! Lovely though all that was, I was here for the wine. I really wanted to get to grips with what made Navarra tick, how its wine industry sees itself and what it does well. I had some ideas, but what I experienced was a real surprise. I found a very mixed picture indeed. I know the region produces a great deal of Garnacha (Grenache) rosé / rosado, but I went there expecting to find a confident wine region that produced good quality Tempranillo based red blends. In the main I anticipated tasting lots of good wines a bit like Rioja, but offering better value for money and which had some Cabernet and Merlot in them. In my mind Navarra was right up there with Rioja and Ribera del Duero as a quality wine region, but was somehow ignored by the consumer. Well, broadly speaking I was right about the value for money and the general quality, but not much else. What I found instead was a wine region with incredible variety. In fact if there was any single message I could take away it was that Navarra has great diversity and produces an extraordinary array of wines. Which we are all used to from the new world, but not so much from European regions and it makes it very difficult to sum up what Navarra is all about. Which must be at least one reason why it is so hard to find Navarra wines for sale in the UK – diversity of styles is not an easy sell. Try as I might I just cannot sum Navarra up in a simple phrase or single style, which might make the wines difficult to sell, but it also makes them pretty interesting. However this lack of a single identity seems to echo that of the region itself. The place is cool, green and mountainous in the north where it borders France’s Basque regions and at one point is just 12 km from the Atlantic. 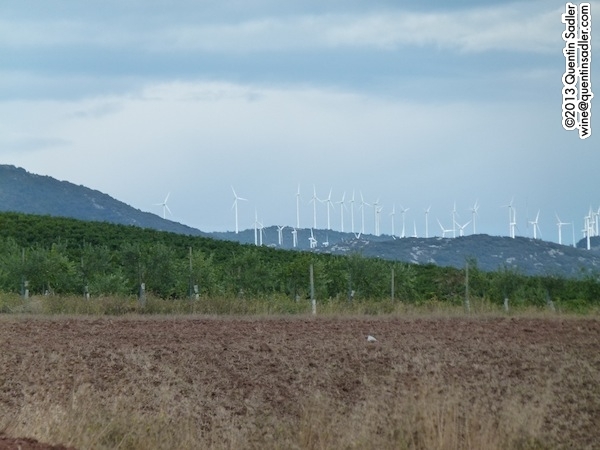 To the south Navarra is a hot, arid plain and more like the Spain of our imaginations – in fact every time we ventured south of Tafalla the rain stopped and the landscape was noticeably drier. Historically too the region has a very mixed heritage. It was once home to the Vascones, a tribe who managed to negotiate a respected place for themselves within the Roman Empire and the whole Ebro Valley became Romanised, rich and known as Ager Vasconum. In later history these people became both the Basques and the Gascons and the wider area became the Kingdom of Navarre. This country straddled the Pyrenees and from 1224 was ruled by French dynasties including that of Thibault 1 the Comte de Champagne – which partly explains why Taittinger Champagne is so widely available in Pamplona. It was not until 1512 that Navarra was incorporated into Spain, making it the last piece of mainland Spain to be absorbed. Even then it retained its own systems and some autonomy, while the people still kept many of their traditional freedoms that made Navarra less feudal than much of Spain. A glance at my map will show you that the Navarra wine region only covers a part of the southern half of the region. They shy away from growing grapes in the cooler north or the mountains – even though Navarra has land very close to Getariako Txakolina and borders France’s Irouléguy regions – and plant solely where there is more sun to ripen the grapes. Many of the wine areas are very close to Rioja and indeed some parts of Navarra’s southern fringes that hug the Ebro River are included in the Rioja Denominación de Origen Calificada / DOCa rather than Navarra’s Denominación de Origen / DO. In all honesty I find it very hard to get to grips with Navarra’s wine history. 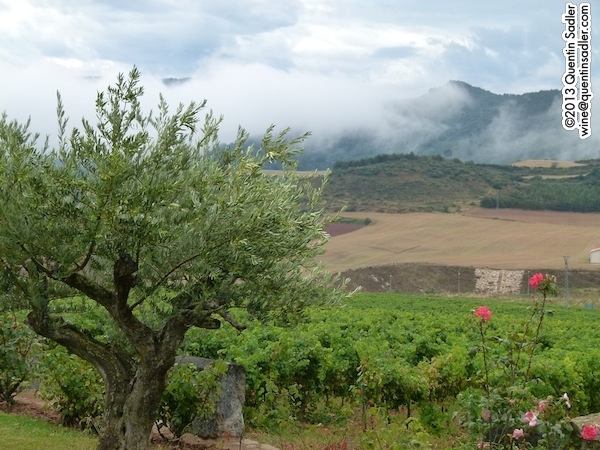 It would appear to have all the same things going for it that made Rioja such a force to be reckoned with – in fact it is even closer to Bordeaux and has more French connections if anything. So why phyloxerra was the making of nearby Rioja, but almost destroyed Navarra seems to be something of a mystery. 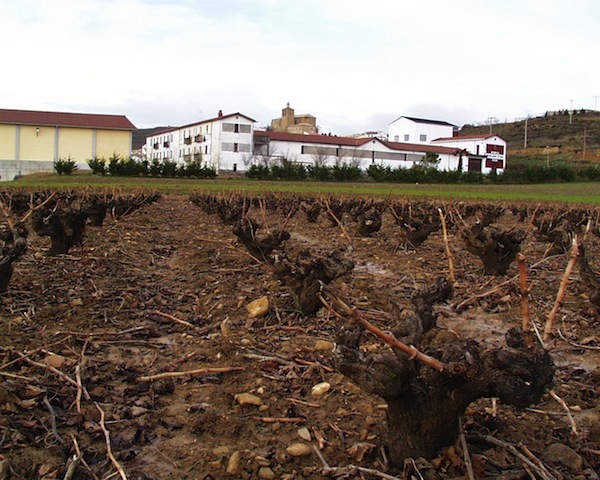 Of the 50.000 hectares of vines in production before Phyloxerra struck, 48,500 were wiped out and it took a long, long time to recover and even now they only have some 12,000 hectares. Having studied the history of Rioja to some degree and toured Navarra, it strikes me that even today Navarra is a land of grape growers and estates, whereas Rioja is only just returning to being a land of wine estates after a century and a half of being dominated by producers who mainly made wine brands with bought in fruit. The difference might be as simple as that, Rioja was in great part controlled by big producers with the money and knowhow to turn bought grapes into good wine and Navarra’s growers would have struggled to keep up with nothing like the clout or economies of scale. So, Navarra missed its moment and had to watch as Rioja became the dominant Spanish wine region and for a long time the only one with true international demand and world renown. The consequences of that are still apparent today and I was really very surprised how there is no clear identity for Navarra even now. They use a broad palette of grapes and produce many different styles of wine. Which makes it slightly harder for the consumer to navigate their way around, but much of what I tasted proved that Navarra is well worth the effort. Map of Navarra – click for a larger view. High-res non-watermarked versions of my maps are available by agreement. Navarra, like Rioja, is made up of sub-zones – 5 of them in fact, however they do not seem to be mentioned on the labels or wine details. So although they are different, have varied soils and differing climatic conditions, the consumer does not really notice whether the wine is from one or the other or is a blend from across the region. Senorio de Saría in Valdizarbe. 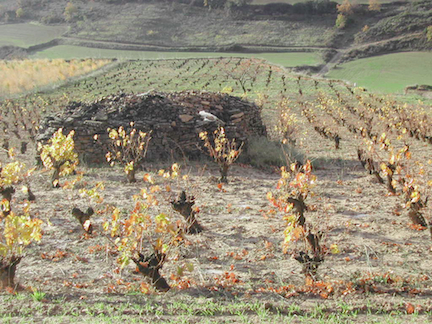 Valdizarbe is the most northerly and cool, often with chalky soils. Tierra Estella is a beautiful and lush place with limestone soils and gently warm with noticeably moist ( sub-humid) conditions – it was certainly damp while I was there. Old vines in Baja Montaña. Baja Montaña is unlike all the other sub-zones. It produces very little wine and is high and cool, however these sunny, but cool hilly vineyards have well drained gravel and limestone soils that together with cool nights seem to be able to produce some astonishing wines – this struck me as a place to watch. Bodegas Inurieta in Ribera Alta. 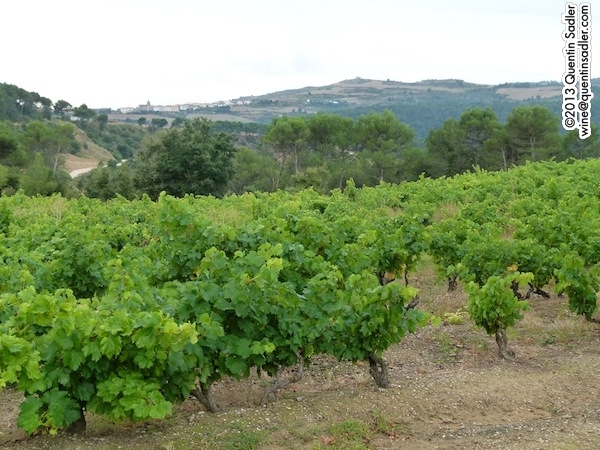 Ribera Alta is a large area that accounts for around a third of all Navarra production. The soils are sand and limestone in the main with a gentle Mediterranean climate that makes it warmer than the 3 northern sub-zones. 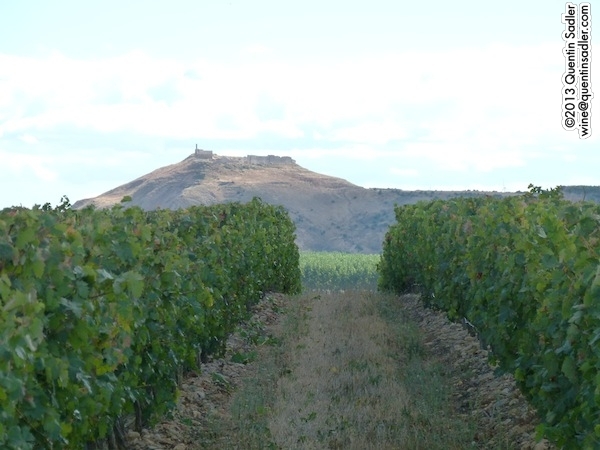 Ribera Baja is actually south of Rioja and is the warmest and driest part of Navarra with an arid Mediterranean climate that produces piquillo peppers as well as being home to the largest number of bodegas in Navarra. This arid plain is a sun trap with sandy soils. Moscatel / Muscat performs well here as well as the red varieties. 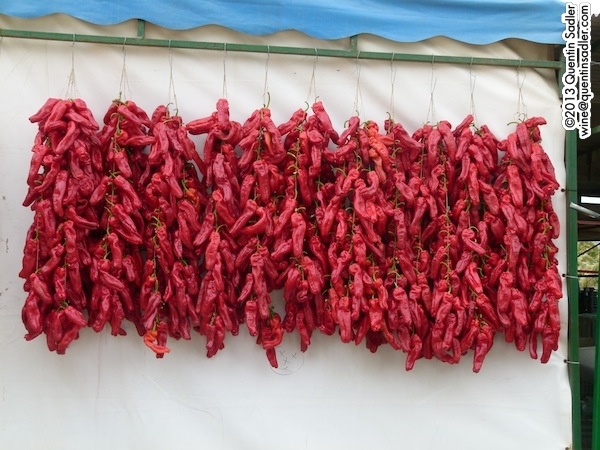 Piquillo peppers hung out to dy. Right now these sub-zones seem to me to be largely an irrelevance which reduces the impact of a simple message about Navarra DO. 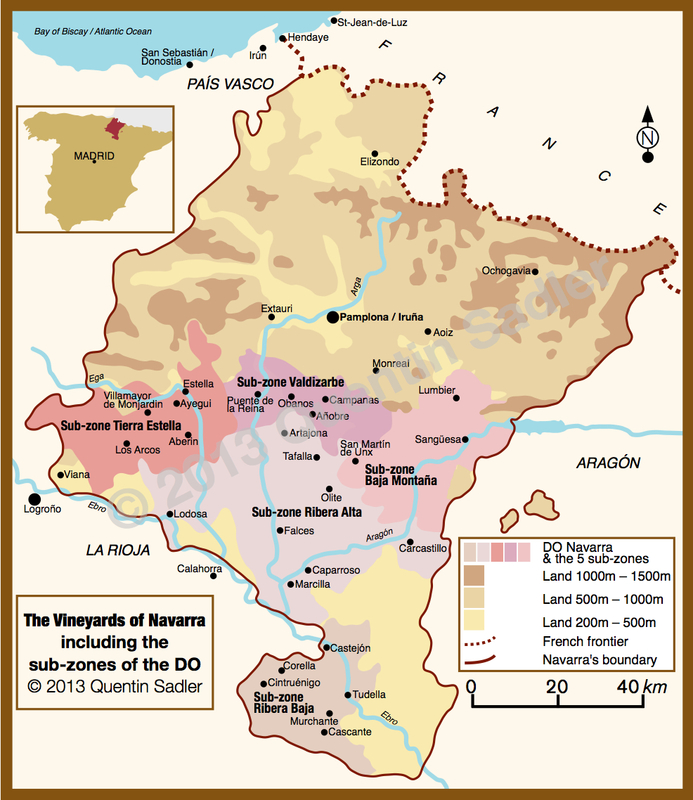 Remember that Rioja on the whole ignores its sub-zones, but perhaps they will become more important and relevant as Navarra builds its following. We actually had this a few times as it is omnipresent in Pamplona’s tapas bars – indeed it is the best selling Rosé in Spain. It is delightful and goes with anything at all – a vibrant, happy, juicy wine bursting with fruit. A lovely, vibrant and bright wine with rich red fruit, almost, but not quite sweetly ripe and a nice dash of tangy acidity. This would perhaps be my choice as representative of good Garnacha rosado. This is made by the delightful Adriana Ochoa who has worked around the world, especially in Australia with Yalumba and the influences show – both ways actually as she persuaded Yalumba to make Tempranillo. This was the palest rosé that I tried on the trip and it was made from a 50/50 blend of Cabernet Sauvignon and Garnacha. It was perhaps the most delicate that we tasted, which gave it a little more class with some minerality, fresh acidity, red fruit and even a touch of tannin making it balanced as well as delicious – it was perfect with our delicious alfresco lunch. Made from 56 year old vines, this is quite superb with real wine aromas of earth, mushroom and savoury herbs as well as bright red fruit notes. The palate is rich, full and textured with ripe red fruit and brambley fruit balanced by a bite of acidity and excellent balance. I really liked this very much indeed, it is intense and full of flavour, a great rosé – 89/100 points. Now quite seperate from Gran Fuedo, the Chivite Family Estates are at Aberin in the Tierra Estella Sub-zone. This is an ambitious wine that aims to be a fine rosé wine. Made from a blend of Tempranillo and Garnacha it is aged on its lees for 6 months in French oak barrels with weekly lees stirring to add texture and complexity – an astonishingly good rosé, one of the very best I have ever tasted – 91/100 points. I really like white wine and have taken to it more and more the older I get. I particularly like Spain’s white wines nowadays. Navarra’s whites puzzled me a bit though, with few exceptions the favoured white grape of the region seems to be Chardonnay and while I have nothing against Chardonnay, many consumers do – in the UK anyway. What’s more, if I want Chardonnay then my thoughts would not really turn to Spain, unless I was in Spain, but then I would want an Albariño, Godello, Verdejo, barrel fermented Rioja or even Txakoli – all classic Spanish styles. I can see that a Spaniard might want a Chardonnay from time to time, but I really think Navarra producers are holding themselves back by over relying on this grape. That being said there were some very nice examples and some that excited me. The lively and fresh unoaked 2012 Chardonnay from Bodegas Señorio de Sarria – think slightly tropical Chablis with a hint of lactic creaminess, while the 2012 Gran Feudo Chardonnay from Bodegas Gran Feudo / Chivite was a little more textured and creamy – but still with good acidity and freshness – was also a lovely wine, both score 87/100 points. I was also excited by the 2011 Nekeas Barrel Fermented Chardonnay made by the charming Concha Vecino at Bodegas Nekeas. It was textured and beautifully integrated with peach, cinnamon, poached pear, gentle oak spice and creaminess all balanced by fresh acidity that kept it delicate and elegant. I would certainly order that if I saw it on a wine list in Spain, it would be wonderful with a sole or a creamy fish pie. This lovely wine is so well balanced it would win many people back to Chardonnay, Concha believes it to be one of the very best in Spain and considering it sells in Spain for around €8, then I think she is right – 91/100 points for quality and value. The one Chardonnay that I have tasted from Navarra which is on a completely different level of complexity is the 2009 Chivite Collecion 125 Blanco from J. Chivite Family Estates. This superb wine spends nine months on the lees in Allier oak and is beautifully rich, creamy, textured and opulent, but well balanced with lovely acidity and good integration of the gently spicy and nutty oak. It isn’t cheap, but is very fine and complex. This is a wonderful wine, wherever it comes from and some claim it to be Spain’s finest white – 93/100 points. As for whites made from anything other than Chardonnay, I only tried a few. Bodegas Inurietta make something of a speciality of Sauvignon Blanc and produce 2 versions. Their unoaked version is called Orchidea and is a nice, direct, limey and attractive Sauvignon. Their oaked version, Orchidea Cuvée is more complex, textured with a leesy lime curd character and a cut of grapefruit-like acidity, it’s a lovely and interesting wine but sadly they only make 5000 bottles. Much as I liked all of these – and I really did – I kept wanting some whites that were just a bit more – well Spanish, or different at least. They planted the French varietals in Navarra because of their historic links north of the border, so what about Basque grapes to give some difference – Gros Manseng makes stunning whites in Gascony and the Basque lands, so what about some more diverse white grapes guys, something you could make your own? For most Spanish wine regions the red wines is what it is really all about and that is certainly true of Navarra. Navarra has long grown the classic Spanish grapes that we normally associate with Rioja, but that are widely grown throughout Spain, Tempranillo, Garnacha and even Graciano and Mazuelo. Over the last 40 years or so though most producers have added classic Bordeaux grapes to their vineyards. They always say this is because of their traditional link with Gascony and Aquitaine north of the Pyrenees and those regions do indeed grow Cabernet Sauvignon and Merlot – I even heard of some Malbec in Navarra too. However these traditional grapes were apparently helped to return to Navarra – if indeed they had ever grown there before – by Juan Magaña who had worked in Bordeaux and wanted to create Navarran wines with the finesses and sophistication of top Bordeaux. To that end he famously smuggled cuttings over the border during the early 1970s – when Spain was still a dictatorship and near siege economy. 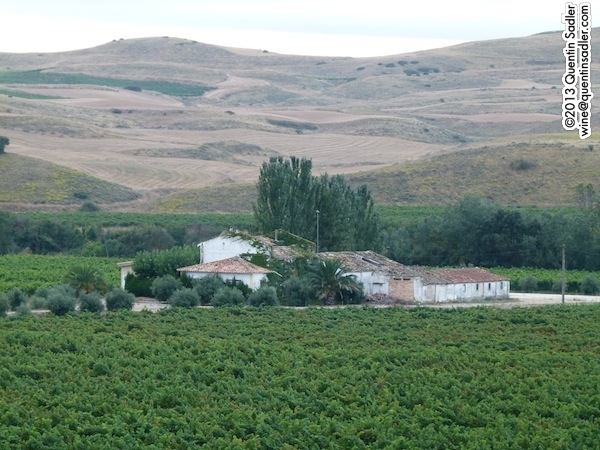 He planted his vineyard and built Bodegas Viña Magaña in Barillas near Cascante in Ribera Baja. If you have not tried his wines they are quite magnificent and I hope to visit next time. I had been looking forward to the Tempranillo based wines and various blends and I enjoyed a good number of them including the following stand out examples. This winery was the first one that I visited and they really impressed me. The winery is very modern and well equipped, even though the the land has belonged to the owning family for well over 100 years. 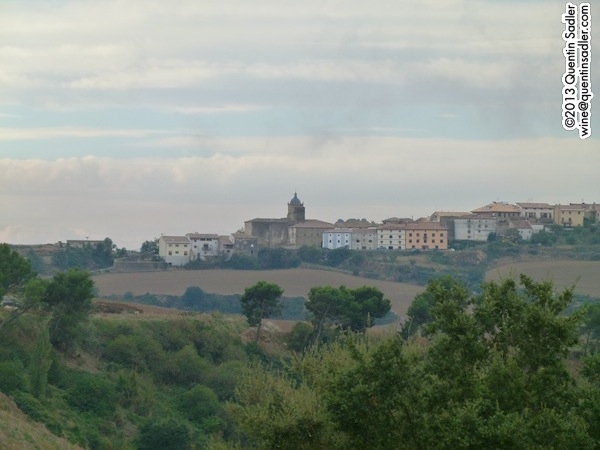 Inurietta is the name of the parcel of land near Falces in the Ribera Alta zone. They grow their grapes at various heights in the valley from 300 to 480 m, which certainly seems to help retain good freshness in the wines. The soils vary from sand and silt to gravels, clay and limestone. Overall I think their wines seem to be very good quality, well made with ripe fruit and an approachable, modern style. Bodegas Inurietta wines are distributed in the UK through C & D Wines. I greatly enjoyed this blend of Cabernet Sauvignon, Merlot, Syrah, Grenache, Graciano and Petit Verdot aged for 14 months in French and American oak. It had good rich cassis and black cherry fruit with soft, but firm fine grain tannins and a cut of fresh acidity as the vines are grown at quite high altitudes – 87/100 points. A 50/50 blend of Syrah and Petit Verdot aged for 14 months in new French oak barrels. This was a hugely impressive and modern style red wine, gloriously smooth and richly fruity with soft, rounded tannins. The oak is nicely balanced with the fruit and supports rather than dominates – 88/100 points. 100% Graciano aged for 15 months in new French and American oak barrels. I’m not always a fan of Graciano on its own and prefer it in blends, but this joins the ranks of the few varietal examples (especially Contino) that I have really enjoyed. The nose offered rich creamy black fruit and freshly turned earth (nicer than it sounds). The palate gives rich, sweet, ripe black fruit and plums together with soft, sweet tannins and a ripe, creamy texture to the fruit and silky tannins. A beautifully made and modern wine with a new world feel – 89/100 points. Puente de la Reina from Señorio de Saría. I have always been fond of this beautiful winery ever since I used to sell the 1978 Gran Reserva in another life and their wines always please the crowds when I show them at tastings. The estate is very peaceful as it sits in rolling tree covered hills, deep in the Sarria Estate which farms many other things other than grapes. Milk and cheese is a speciality too, in fact of 1500 hectares, only 210 are used for wine production. Most of the vines are on south facing slopes at between 400 – 500m allowing the wines to keep good balance between fruit and freshness. Señorio de Sarria wines are distributed in the UK through Boutinot. I have always been fascinated by this single vineyard multi-varietal blend of Tempranillo, Garnacha, Merlot, Cabernet Sauvignon, Graciano and Mazuelo. The vines are 53 years old and grown around the Castillo de Sotés just over the hill from Saría itself. The wine was aged 9 months in French oak barrels. This has lovely intensity and weight, with a creamy ripeness of fruit, the palate also has a firmness that I like, the acidity is there but masked by everything else, it just supports. Medium-bodied, dry and structured, but a lovely wine for posh everyday drinking – 87/100 points. This wine has always delivered superb value for money and is a great bottle of wine that tastes as Spanish as they come, despite only having French grapes in it! The blend is 70% Cabernet Sauvignon to 30% Merlot aged for 36 months in oak, the Cabernet in French and the Merlot in American. The colour was an earthy garnet, while the nose offered leather, dried fruit and fragrant smoke. The palate gave prunes, plums, mocha tinged oak and intense sweet ripe fruit together with savoury characters, lovely weight and a silky texture. 89/100 points. Available in the UK from Caviste @ £14.95 per bottle. Their Reserva Especial was also rather good by the way. Another beautiful spot in Valdizarbe, the sunny Nekeas Valley seems to produce some good wine and I had never stumbled across them before. They claim to have the most northerly olive groves in Spain too and make some superb olive oil. Historically the place was an important producer, but the vineyards were unused for 100 years before being brought back to life in 1989. The vines form a single block, interspersed with olives, growing between 450 and 650m. Concha Vecino winemaker at Nekeas. 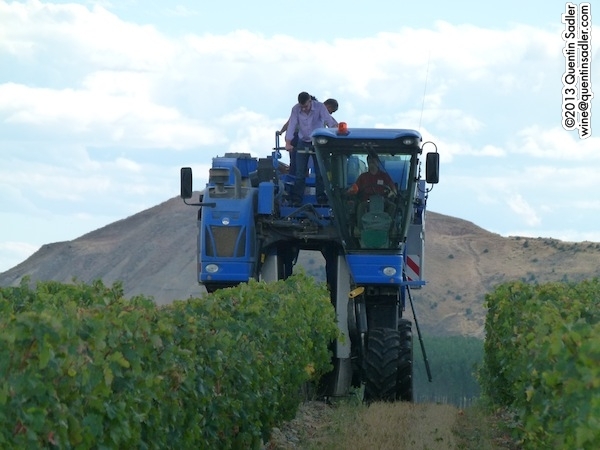 Nekeas’s secret weapon is their wonderful winemaker Concha Vecino. She has such passion for the place and what she does and love for “my grapes” and “my wines” that she is hard to resist. Her enthusiasm is catching and what is more she really knows what she is doing. Subtlety seems to be her watchword and she makes very good wines which really try to capture the character of the place. As Concha says “Oak and tanks are for everyone, but my valley is just for me”. A 60/40 blend grown at the top of the valley slopes. The wine is aged for 14 months in French oak and is unfined and unfiltered. This gave a lovely aroma of wild herbs, earth and flowers together with studs of deep red fruit. The palate had great concentration of rich cassis and redcurrant with high, fresh, clean, tangy acidity. Very soft, smooth texture, there is a seam of gently firm tannin leaving a slightly chalky finish. Intense, but delicious, the finish gives herbs and lavender. Over all it has lovely balance and purity – 88/100 points. A 50/50 blend grown in very high vineyards on poor, thin, stony soils. The wine is aged for 18 months in French oak of around a year old. The colour is dense, blue black and opaque. The nose offers rich notes of mocha and sweet tobacco with clean earth together with dried cassis and the beginnings of prune and fig. The palate is rich, creamily ripe and succulent, with deep sweet black fruit and is pretty full bodied and concentrated with good acidity and running through it. This is very good and attractive wine – 89/100 points. We will hear a little more about Nekeas very soon…. I am so glad to have finally visited Chivite, even if it was a rush. They are so important to Navarra, having been grape growers since 1647 (which is just before lunch in Spain) and have produced wine since at least 1860 – their superb Colección 125 range was created in 1985 to celebrate the 125th anniversary of their first wine exports and have always been some of the very best Spanish wines. Now the Colección 125 are produced at the Chivite Family Estates at Aberin in the Tierra Estella sub-zone, sadly I did not get there, but did try the range and they are all magnificent wines. We had a light lunch here and the centrepiece was a stunning Tortilla. We asked the lady who made it what the secret was of that lovely soft texture and it seems it was a litre of olive oil poured into the egg mixture! You live, you learn. After years of family problems an 11th generation Chivite is once more in charge, Julian, no less and I was so excited to meet him that I forgot to take a photograph! 50% Tempranillo, 30% Garnacha and 20% Cabernet Sauvignon aged for 18 months in French and American oak. A wonderful wine with the punch of young Grenache dominating the pure red fruit and spice laden nose. Rich, supple palate with the Tempranillo providing the weight and taut, smooth tannins, while the Garnacha gives the fleshy texture and brightness. Lovely supple freshness, medium bodied and elegant with a lovely savoury finish, smooth supple tannins, vanilla and mocha oak notes and fresh acidity all dominated by rich red cherry and blackberry fruit – 88/100 points. 50% Tempranillo and 50% Garnacha from vineyards planted between 1954 and 1960. The wine was aged for 12 months in American oak. A lovely wine, it somehow feels classy with fine grain tannins and burnished coffee character as well as bright black cherry fruit, vanilla and spice. A lovely elegant, easy wine – 89/100 points. This vintage was pure Tempranillo aged 14 months in French oak barrels 40% were new and 60% second use. I had not tried this for a while and it was as good as I remember, rich and concentrated but still elegant, classy and complex with lovely fruit concentration giving a creamy quality, deep black fruit, subtle use of oak giving nice spice nuances and some mineral, earthy characters. A beautiful wine of great finesse – 93/100 points. Now all the wineries that I have written about here make lovely wine that I rate highly, but Ochoa was such a wonderful visit. The Ochoa family seem to have been involved in Navarra wine for centuries, but the winery only goes back to 1908, but like so many other producers around the world, the focus on quality wines only began in recent times when the delightful Javier Ochoa took over. 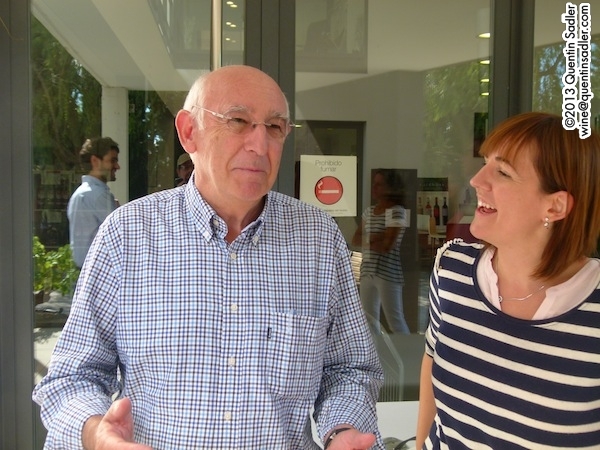 In recent years Javier has been joined by his daughter Adriana as enologist and her passion for the vines and the wines she makes from them really shows. 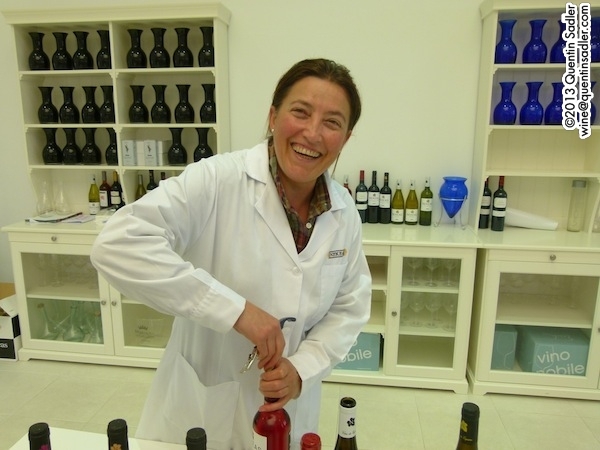 What also helps is that Adriana has made wine all around the world and especially has experience of making wine at Yalumba in Australia and her go getting attitude really shows. I thought that all her wines were very good quality indeed. The Ochoas farm 143 hectares just south of Olite on clay and limestone soils that face south giving excellent sun exposure. I loved their enthusiasm and exuberance, touring their vineyards was a delight, whilst riding a grape harvester was just a wild experience – oh and the lunch was superb too. 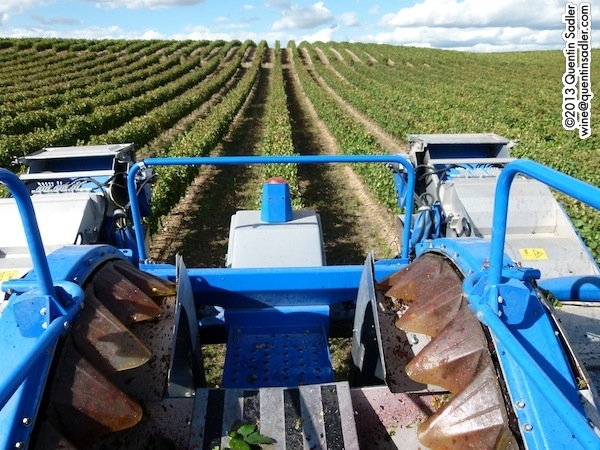 The Ochoas, like most Navarra producers I met – and Miguel Torres – are certain that machine harvesting is just as good as picking by hand. Views from Ochoa’s Traibuenas vineyard near Olite. The same view with the harvester. 55% Tempranillo, 30% Cabernet Sauvignon and 15% Merlot aged for 15 months in French and American oak. Gosh I really liked this wine. We might technically have had finer wines on the trip, but this was so good and so joyful to drink that I rank it pretty high. It still has lovely fruit, giving a soft and succulent character, but there is just the beginning of dried fruit, leather, coffee and mocha too. The tannins are smooth and silky while the flavour lasts and lasts – 90/100 points. So, from everything I had experienced so far, Navarra’s ability to produce good rosé from a range of grapes, but especially Grenache / Garnacha is well deserved and my view of them as good quality rosés is increased. My opinion of the white wines from Navarra has certainly grown, I tasted many good Chardonnays made in many different styles – and some non-Chardonnays too – most of them I would happily order and drink with pleasure. My only quibble is that here in the UK anyway the word Chardonnay is not considered a good thing to have on a wine label. To me it feels limiting to major on a foreign white grape that cannot ever really be your own, especially when Spain and the Basque lands are full of wonderful white grapes, but that might just be me. All I know is that most UK consumers would not want to buy a Chardonnay and I am unlikely to ever order a Spanish Chardonnay, even if it’s good, because I want more traditional Spanish styles. As far as the red wines were concerned, I liked what I saw from all the producers that I have written about here and more. I had always seen Navarra as a producer of Tempranillo, Cabernet and Merlot blends and I found many of them to be very good quality indeed and well deserving of being more popular and sought after. However the red wines that I found the most startling and exciting were not made from Tempranillo, Cabernet Sauvignon or Merlot at all. They were actually made from a grape variety that I am not particularly keen on either. I knew Navarra grew it because they make rosés out of it, Grenache / Garnacha is a classic Spanish grape, but I hardly ever seek it out. It of course produces great results in blends in Rioja and Priorat, but as a varietal it hardly ever moves me. 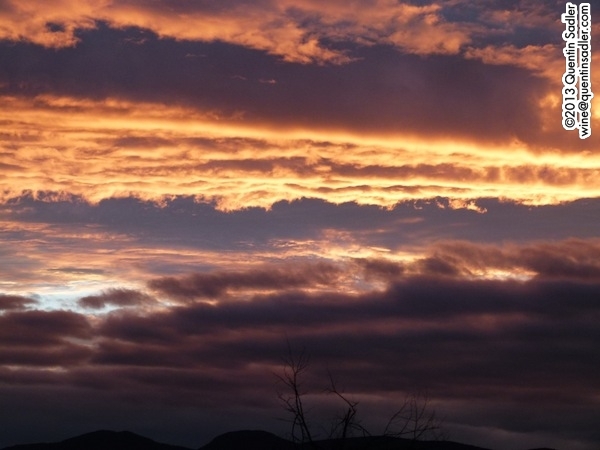 In Spain it is grown in the hot regions of southern Aragón – Calatayud, Cariñena and Campo de Borja – where it makes nice affordable wines that can be fun and great value, but hardly ever amazing. So you could have knocked me down with a feather when I tasted a Garnacha from Navarra – pretty much against my will – and I loved it, I became hooked and wanted more, so tasted all the Garnacha I could find. I was wondering why I liked them so much when Concha Vecino put her finger on it. She described them as the “Pinot Noir of Garnachas” and the only Atlantic Grenaches in the world. We are so used to Grenache being seen as hot climate grape that hearing how well it does in a cool area is quite astonishing and changes all the rule. However it must be said that another favourite Grenache of mine this year was the magnificent 2007 Villa Maria Reserve Grenache from Hawkes Bay in New Zealand, another place that is pretty cool and with a sort of Atalantic climate. Sadly this wine is so far produced in such small amounts that it is not available in Europe. The good news is though that these cool climate Garnachas from Navarra are available and often deliver great value for money. These vineyards this wine comes from are at the highest point of the valley – the high plain or chaparral – and the vines are between 70 and 100 years old. The wine has a short time in French oak to give it a dusting of spice and touch of complexity. It gives rich aromas of red fruit with caramel, vanilla, red fruit and spice. The palate is rich, smooth, supple, savoury and nicely tarry, with gently firm tannins and lovely intense rich sweet fruit, while throughout the wine is this lovely freshness, purity and cut of clean acidity. Do try it – 90/100 points. Available in the UK from Majestic Wine Warehouses @ £9.99 per bottle. Old vines with Bodegas Palacio de Sada behind. Palacio de Sada are very near Sangüesa in cool high land with stony soils. It has been left behind by time a little, so they still have 200 hectares of old vine Garnache, much of it over 100 years old. Even with the newer 400 hectares the average age of their vines is still over 30 years old! This was my first Garnacha from cool climate Navarra and I was very taken by it. It is simple, unoaked and juicy, but wow it’s delicious. If I had a wine bar or wine company I would order it straight away. It smells of freshly crushed raspberries and tastes of a whole melange of fresh red fruit and spice – my note says “Sangria for grown ups”! The cool, high altitude conditions give this wine a lovely seam of freshness which I think makes it such a joy – 90/100 points, mainly for the pleasure it delivers. Palacio de Sada wines are distributed in the UK by Amathus. 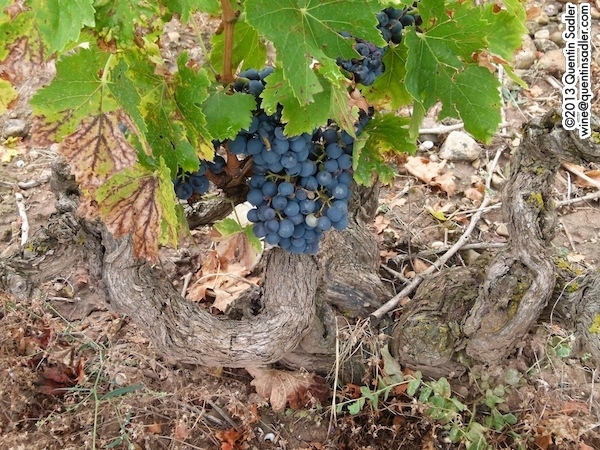 75 year old Garnacha bush vines organically grown on dispersed plots on cool rocky soils at 600 – 750m. It the brainchild of mavericks, or fanatics (in the best sense) Enrique Basarte and Elisa Úcar who say of their wines that “Atlantic Grenache, mountain viticulture, spectacular soils make it possible to obtain this ‘savage’ expression of the Grenache Grape”. The finished wine was aged 14 months in French oak. I saw the road signs to the wonderfully named San Martín de Unx and it stuck in my mind. I wish we had gone, because this was the most exciting wine of the trip, only just and even then because it was so unexpected as much as anything else, but it really is a great wine. The nose is fragrant and elegant with a purity about it. The palate is balanced and fine with poise and elegance and it carries the 14.5% alcohol perfectly. It is quite rich and concentrated, but also fresh and lively and feels much more Burgundian than Rhône-like. A great, great Grenache that I would love to try in a couple of years – 93/100 points. Domaines Lupier wines are distributed in the UK by Fields, Morris & Verdin. Juan Carlos Lopez of Bodegas Artadi fame has spread his wings since 1996, making superb wines in Alicante and also Navarra as well. Their Navarra estate is situated in Artazu just over the river Arga from Señorio de Saría and not far from the Camino de Santiago. Their vineyards grow at 500m and the primary focus is red Garnacha, especially in the flagship wine Santa Cruz de Artazu. Which in itself is interesting as at nearby Saría they were adamant that the best use of their old Garnacha vines was in their Viñedo N° 5 Rosado, rather than in a red wine. Certainly it is warmer and more humid here than in Baja Montaña and it shows with a heavier, richer and more brooding and spicy style that has intense smoky sweet black fruit and smoky fine tannins. This is a very different take, but still very fine. It needs a lot of time and a lot of food – 92/100 points. Artadi and Artazu wines are distributed in the UK by Fields, Morris & Verdin. However much I liked many of the other reds – and I did – it seemed to me that with red Grenache Navarra has found its star grape. I have never tasted Garnacha as fine, complex or interesting as these – do try some if you can. The freshest example I have tried, it is not fortified and the grapes are only a little bit over-ripe. It’s so light and clean and pure that it seems to sing. It feels very simple in many ways, but is so, so deliciously full of fresh, lively peaches, honey, flowers and almonds that it is almost impossible to resist – 90/100 points. Available in the UK from Winedrop.co.uk @ £11.75 per half litre / 500cl. This is a richer , but still fresh, and honeyed, sweet and a delicious take on the style. The aromas are quite lifted and vibrant with honey, blossom and aniseed as well as lemon shortbread notes. Interestingly the partially fermented grape juice is fortified with local Orujo – a Spanish grappa. Quite a classic style in Spain – 87/100 points. 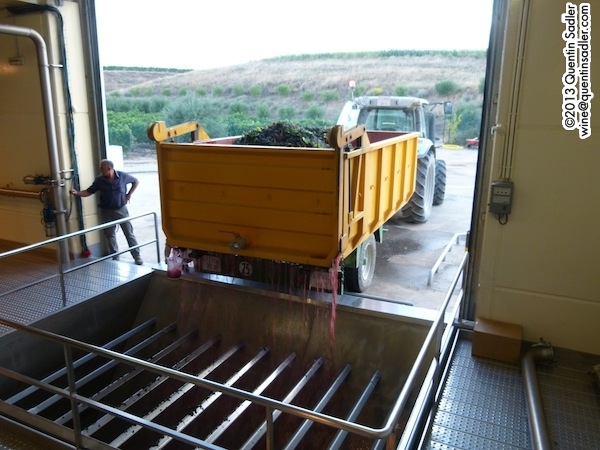 A more complex style, this is late harvested and partly botrytised Moscatel / Muscat with he grapes being picked in 12 successive tris through the vineyard to get the ripest grapes. The wine is fermented and aged for 5 months in French oak and it really is stunning, honeyed, concentrated and rich as the Sultan of Brunei – 91/100 points. Available in the UK from Waitrose @ £19.99 per half bottle. This wine is bonkers! It is amazingly concentrated and ripe with deep prune, fig and raisin characters, rum, caramel and nutty toffee too. It is made a bit like a Madeira with ageing in a mixture of wooden barrels and glass demijohns on the roof for 7 years. It is so, so lovely, like sticky toffee pudding in a glass – who needs the dessert? In style it is like a joyous cross between PX and Rutherglen Muscat with more freshness and salinity. It is intensely sweet, but also has an intense savoury richness, truly great wine – 93/100 points. Available in the UK from Templar Wines @ £19.25 per half litre / 500cl. So, the whole trip was quite an experience and Navarra delivered up more variety and more unexpected gems than I could imagine. I loved the wines and the place and if you drink a few of these wines that I have mentioned, then so will you. and wine lists for my wine trade customers. I also travel widely, tasting wine and experiencing wine regions and wineries. From time to time I have things that I want to share with you. In these pages I will mention wines, wine events, trips that I make as well as details of restaurants and meals that I have enjoyed or anything about wine, food and travel that strikes me as interesting. Please leave a comment and contact me. Catavino – the Iberian wine page – with some articles by me! Great courses and tastings at the West London Wine School – many given by me! Great wine courses, many taught by me! My web site, even more about me! Wine on the Rocks – the great Finkus Bripp! All rights reserved: all content © 2009-2012 Quentin Sadler unless otherwise stated.